Just two short years ago, LaMarcus Aldridge was a perennial All-Star and the crown jewel of the free agent market. What happened? I was scrolling through the proverbial rabbit hole that is Twitter the other day when I came across a Tweet that caught me by surprise. Biggest divide between a team’s best player and second best player? While the results of this poll are entirely subjective, it still speaks to the radical decline LaMarcus Aldridge experienced in his play last season. Some of this divide can be attributed to Kawhi Leonard’s emergence as an MVP candidate and two-way superstar, but much of it can be explained by Aldridge failing to live up to the expectations of the four-year, $84 million contract he signed two summers ago. To contrast this, ESPN listed Aldridge as the league’s 13th best player back in 2015, ahead of superstars Jimmy Butler and Kyrie Irving. And even last year, Aldridge was still ranked 23rd, ahead of multiple-time All-Stars DeMar DeRozan and Paul Millsap. How did we get to this point? What happened? In order to answer these questions, let’s first articulate, in detail, how Aldridge’s game suffered last season (compared to 2015-16) and then attempt to explain why regression occurred. Back in 2015-16, Aldridge’s first season with the Spurs, he was largely the same player as during his time with the Portland Trail Blazers, when he was one of the league’s top power forwards. Albeit his raw numbers were down (points, rebounds) due to a decreased usage rate (30.0 in 2014-15, 26.0 in 2015-16), he experienced an uptick in field goal percentage, true shooting percentage, offensive rating and net rating, landing him a spot on his fifth Western Conference All-Star team. Yet this past season, Aldridge struggled to replicate those numbers. After shooting a career-high 51.3 percent from the field in 2015-16, Aldridge sported a 47.7 percent clip last year. Furthermore, his advanced shooting percentages (true shooting, effective field goal), offensive rating and net rating also waned. Such regression was no more evident than during the 2017 Western Conference Finals when the five-time All-Star averaged just 15.5 points and 5.8 rebounds on 41.2 percent shooting. Tim Duncan’s retirement could explain Aldridge’s decline, but after signing Pau Gasol last offseason, the Spurs still had two extremely gifted offensive talents in the frontcourt. 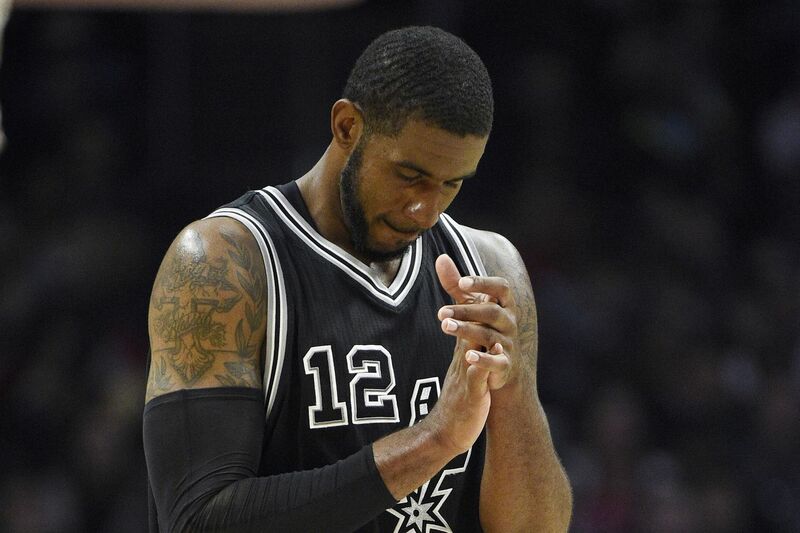 An extensive look into Aldridge number’s further describes his diminished offensive impact. Aldridge is not the most explosive scorer, instead finding success from the mid-range area via a plethora of pick-and-pops and isolation plays. During his All-Star season with the Spurs, the 32-year-old shot 43.6 percent from mid-range. Last season, he shot just 41.5 percent from the same area. In particular, Aldridge’s patented turnaround and fadeaway jumpers saw a steep decline in efficiency (from 48.7 percent to 39.7 percent). While these numbers may describe Aldridge’s regression, what caused the disappointing season? There certainly exist some external factors, but the central concern could be his arrhythmia, a condition which disrupts the rhythm of his heart beat. The condition reared its ugly head last season, forcing Aldridge to miss a string of games in mid-March. This was not a new problem for the Dallas, Texas-native. Aldridge was first diagnosed with the condition in 2007, and in 2011, just before the start of the lockout-shortened season, he underwent a minor procedure to help correct the issue. Arrhythmia can occur due to an electrolyte imbalance, just the kind of thing professional athletes have to prepare against. Health issues aside, another component to Aldridge’s on-court struggles could be related to Leonard’s increased offensive responsibilities. Despite Leonard being the superior player the last two years, the duo had almost identical usage rates in 2015-16 (Aldridge: 26.0, Leonard: 25.8), serving as options 1A and 1B for the Spurs. Yet last season, Leonard was clearly the No. 1 option with a 31.0 usage rate to Aldridge’s 24.9 — a number far closer to Pau Gasol’s (21.6) than Leonard’s. As a player whose offensive repertoire is primarily reliant on jump shots (62.1 percent of Aldridge’s field goal attempts were so classified as such last season), much of Aldridge’s game is predicated on rhythm, something he may have struggled to find as he transitioned to a complementary role alongside Leonard. Yet even then, the difference in usage rate was substantially less between 2015-16 and 2016-17 relative to 2014-15 and 2015-16, when Aldridge was an All-Star. The root of Aldridge’s regression isn’t so easily nailed down. Upon signing with the Spurs, Aldridge was billed as Tim Duncan’s successor, forming a potent duo with Leonard in the post-Duncan era. Aldridge knew Leonard was a budding, albeit modest star prior to signing with the Spurs. But back then, Aldridge was both the better player and the one who would presumably get the lion’s share of attention. Leonard, while still quiet and reserved, has received far more exposure in recent years, including starring in multiple Jordan Brand commercials. For someone who reportedly “loathed” dealing with the fanfare Damian Lillard received as the Blazers franchise centerpiece, which factored heavily in his decision to leave Portland, adjusting to his new role as San Antonio’s secondary option, rather than a co-No. 1, could certainly have taken its toll. With the Houston Rockets and Oklahoma City Thunder among others acquiring superstar-level talent this summer, the gap seems to have narrowed considerably between the Spurs and other Western Conference foes. A healthy and reinvigorated Aldridge could ensure the Spurs remain a top two seed. Another season of the 2016-17 version of Aldridge could mean battling it out to simply ensure homecourt advantage in the first round. With an offseason to make the necessary amendments in order to maximize his talents and adjust to a secondary role, it’s possible that Aldridge could return to his ways of old next year. To do so though, he will need to place winning above all else (if he hasn’t already) and come to terms with Leonard as the face of the franchise. Add in a seemingly clean bill of health while playing in a potential contract year (player-option for 2018-2019) and it’s possible the Spurs could once again roster two All-Stars next season.